Get strategic on big accounts. Win the opportunities that matter. And once we’ve landed, grow the account. 2016 was the year that strategic outbound and account-based approaches stepped out from behind the inbound shadow. Over the last 3+ years, the thinking, the tools, and the tactics have continued to evolve. I thought I’d share what I’ve seen change over that time both in our client work and in our experience as a consulting firm selling to named accounts. 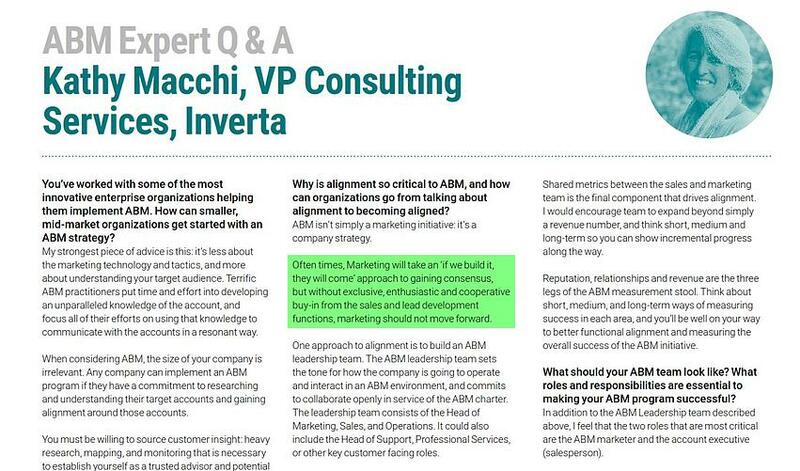 It just so happens that my friends over at Engagio recently published a revised second edition of their ABM ebook. I’ve included snippets below to emphasis my points. 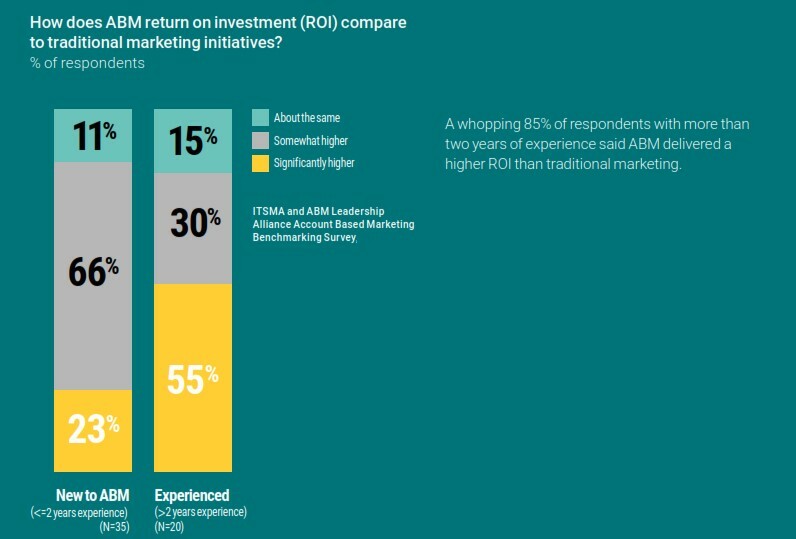 In the early days, ABM was talked about as a strategic approach to deepening engagement in key accounts. Soft language, soft metrics, and soft ROI. Over the last three years, the thinking has hardened. Engagement is a step on the path to revenue, not the promised land itself. I like this definition of ABR: a coordinated go-to-market strategy to land and expand target account. Big company + right title + inbound = fat chance. The problem with whale hunting is they stubbornly refuse to harpoon themselves. In all likelihood, the person you most need to speak with to launch your sales process is the person least likely to download your white paper, attend your webinar, or chat with your bot. The unit economics of named accounts selling are actually better. In modern selling, almost all buying decisions are made by committee. Focusing on circles of influence (let’s get as may of them as possible talking about and engaging with us) costs more than prospecting single thread accounts. But the returns in initial ACV more than makeup for higher CAC ratios. Winning account-based revenue requires move than Marketing selecting target accounts, building programs, emailing account plans off to the SDRs and AEs, and expecting everyone to dutifully run their pre-choregraphed routes. AEs need to green-light account selection. Marketing can and should score territories according to potential, fit, and interest. But AEs need to be in on account selection—hopefully they have insights that go beyond demographics and digital footprints. Bottom line, if Marketing is wrong on account selection, they get bad ROI. If the AE is wrong, they miss their number and get fired. Sales needs to believe in the list from the get-go. Don’t bury the engagement data. Too often the period from launch to pipeline is a black hole for the sales side of the house. The entire account team—ABR-Marketers, SDRs, AEs, and designated Exec sponsors—need to see that progress is being made. Counts of quality conversations, display interactions, new contacts added, time on site, etc. – all that needs to be summarized and packaged for AE eyes. The most dangerous time for any account-based program is silent period between launch and first results. Don’t let the result of absence lead to an absence of results. Silence is your enemy. No one will admit to going outbound with vanilla messaging. Ask any sales leader who’s read The Challenger Sale and they’ll assert their team absolutely takes a Teach and Tailor approach. 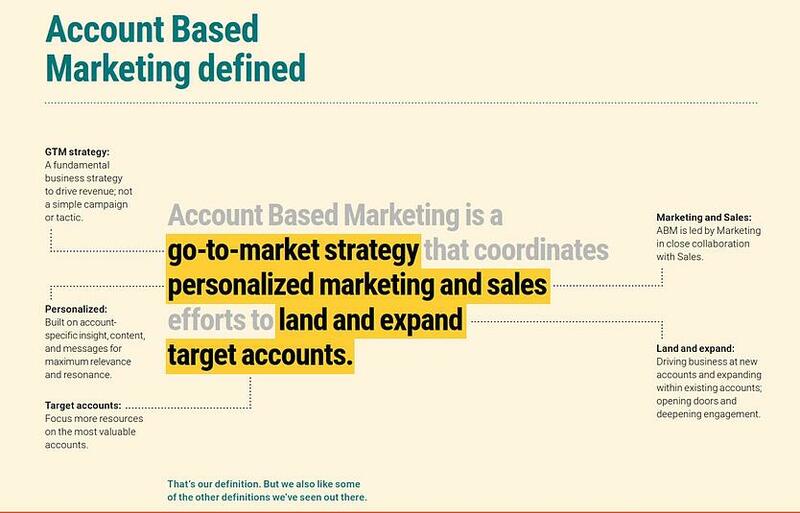 The reality is that messaging considered "tailored" at the mid-market is generic as heck at the named account level. ABR-insights have to be much, much better. Personalized email and branded socks aren’t going to get it done. There’s too much time, effort, and energy involved to finally connect with a named account and fall flat with the offer of a canned demo. What works for the masses doesn’t work here. Marketing can and should roll out the initial account play(s). But it doesn’t end there. SDRs, AEs, and the entire account team need a way to collaborate and spitball. Something as simple as a Google Doc per account can serve as a repository and launching pad for translating insight into action. 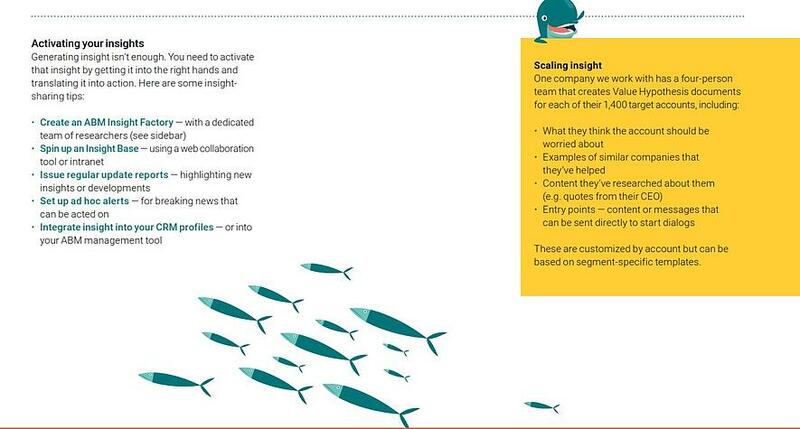 I love this scaling insight idea of a team for creating “value hypothesis” in real-time. Just three short years ago, it seemed like the dawning of a new era. Any scrappy company could take down an elephant with a little bit of Marketing guile, some Sales grit, and a generous helping of account-based technology. And then…we descended from the peak of inflated expectations to the trough of disillusionment. It turns out, the robots aren’t coming for all our jobs (yet). A fair bit of the hype around scaled drip, display, and direct mail has turned out to be a lot of hooey. From the pilots I’ve seen, the data is clear: humans drive meetings. Now, tech-supported humans drive even more meetings. But MarTech alone—no matter how targeted the copy—doesn’t put meetings on calendars. Some ABR-worthy accounts are more worthy than others. Much like in wealth, the top 1% and the top .1% don’t have much in common. This is true both in terms of opportunity for your company and tactics required to get their attention. Tiering selected accounts is critical. The math has to balance cost and potential before we get to launch. Well, that's what I've have learned in a nutshell. I'm interested in your learnings too. Please share in the comments below. We need to help each other figure this stuff out. Now, if you want 180 pages of solid, actionable advice on ABR, download the updated ABM Guide from Engagio. It's crazy good and I know you'll love it.